This statue of General Gordon is located in the riverside park at Gravesend in Kent, close to Gordon Promenade and Khartoum Square. Gordon had been born in SE London in 1833, the son of an army officer. Gordon and all of his brothers joined the army when they were old enough. His first commision was to oversee the construction of defences at Milford Haven in Wales. It was whilst stationed here that he became a Christian, although he never aligned himself with any denomination and enjoyed attending services in many different churches. He once remarked to a priest that the church was much like the army ‘one army, but many different regiments’. He saw service in Crimea and China before returning to the UK in 1864 and was placed in command of the defences of the River Thames and its estuary. He based himself at Gravesend. His views on the defence of the river were ignored but, under protest, he carried out the plans of the War Office. In Gravesend Gordon is not remembered for his military activities, but for his work with the poor and homeless of the town including teaching at the ‘Ragged School’, feeding and housing homeless boys and the dedication on his statue ranks this work over any of his other achievements. He spent much of his salary on his chariable projects. He left Gravesend in 1871 to work on the Danube navigation and then as war graves inspector in the Crimea. whilst on this trip he met the Prime Minister of Eygpt and he was attached to Eygptian forces (with the consent of the British Army). He was appointed governor of Equatoria (South Sudan and Northern Uganda). He did much to suppress the slave trade in the area. Eventually he became Governor-General of the Sudan. He worked to abolish torture and public floggings and became well-known for his obstenacy. He once joked that ‘the Gordons and camels are of the same race. let them get an idea into their heads and nothing will take it out’. He did much to maintain peace in the Sudan, including on one occasion riding into the rebel camp armed only with his cane to demand the surrender of the rebel forces. Exhausted he resigned in 1879 and returned to London. He was in much demand. the King of Belgium offered him the Governorship of the Congo and the Cape Colony approached him to become its military commander. He became private secretary to the Governor-General of India but resigned after a few weeks because he found it boring. Against the wishes of the British Government, he travelled to China to try and broker peace in the tensions between China and Russia. After predicting that the actions of the ruling elite would eventually lead to a revolution of the people he was expelled from Beijing. Under threat of discharge from the army, Gordon returned to London. He set about championing land reform in Ireland, much to the annoyance of William Gladstone, the prime minister. He was soon sent off to command the Royal engineers in Mauritius, building defences against a possible Russian attack. He was posted to the Cape province the following year and in 1882 went to Palestine, where he visited the historic sites of Christianity. He returned to London in 1883 and he was sent to Sudan to counter the Sudanese revolt led by the Mahdi. The situation worsened and following the defeat of the Egyptian army, Gordon was sent to Khartoum to evacuate the city. However, the Egyptians had other ideas and pressed him to take control and expel the Mahdi and his forces and he soon decided to hold the city against the rebel forces. The siege of Khartoum began in March 1884. The British Government had decided to abandon Sudan, hence the evacuation plan, but Gordon had other ideas and had great public support. In August the British Government bowed to public pressure and issued the orders for a relief force to be sent to Khartoum, but it was not until November that it was ready to leave. In January 1885, the fort at Omdurman fell to the rebels enabling them to fire with cannon on the city. The relief force defeated a rebel army on 18 January leading the Mahdi to realise that if he was going to capture the city he needed to do so before the relief force arrived. It took only an hour for them to breach the defences and thereafter killed 10000 soldiers and civilians including Gordon. The relief force arrived on 28 January, two days after the city had fallen. Under heavy fire, they turned back from the city. The failure to rescue Gordon was a major blow to the government’s popularity and Queen Victoria sent a telegram rebuking Gladstone for his lack of action. This was leaked to the press and added to the government’s unpopularity. Stones were thrown at the windows of 10 Downing Street and Gladstone was dubbed ‘Murderer of Gordon’. But they stuck by there decision to abandon Sudan. The Mahdi, encouraged by the lack of international action established a state which reversed many of the reforms Gordon had introduced. It is estimated that between 1885 and 1898 approx 8 million people died in the lands controlled by the Mahdi. Eventually, in 1898 a force under general Kitchener comprehensively destroyed the rebel army at Omdurman. It was subsequently revealed that the expedition had eventually been sent because the British Government was concerned that the French might try to liberate Sudan and establish control. 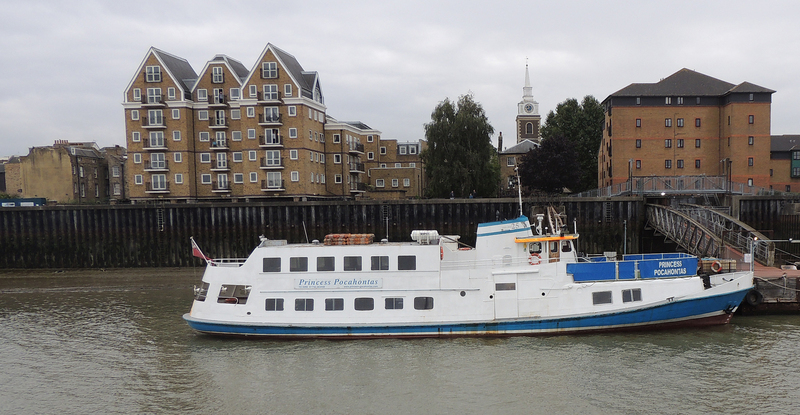 Our trip on the PS Waverley starts at Gravesend, which is a town with a long and interesting history. 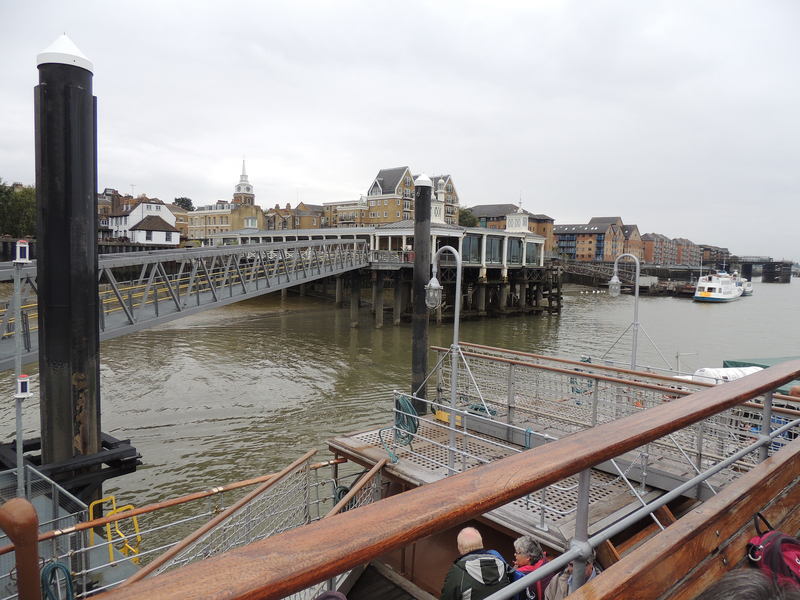 Royal Terrace Pier was built in 1842 to accomodate day trippers from London who arrived by steamer. One notable visitor in 1863 was Princess Alexandria of Denmark on her way to marry the then Prince of Wales, later Edward VII, son of Queen Victoria. St Andrews Chapel was built in 1871 as a mission church to the waterfornt community. It is now an arts centre. The area around the chapel was known as Bawley Bay and was a wharf for shrimp boats in the 19th century. It was also a departure point for families emigrating to Australia and New Zealand. In the gardens of the Royal Clarendon hotel is the remains of the Gravesend Artillery Blockhouse, which dates from the reign of Henry VIII. It was one of 5 built in the area to protect the river access and docks. The hotel was originally built as a house for James, Duke of York, later James II. It became quarters for the ordinance depot keepers and subsequently a hotel. Town Pier was built in 1834 and restored in 2000. At the town end is the ‘Three Daws’ which claims to be the oldest Public House in Kent. The cruiser is named after the Indian princess Pocahontas who had married tobacco planter John Rolfe in Virginia in 1614. In 1616 the Rolfe’s decided to return to England and Pocahontas became something of a celebrity even attending a ball at Whitehall Palace, the prinicipal royal residence at that time. 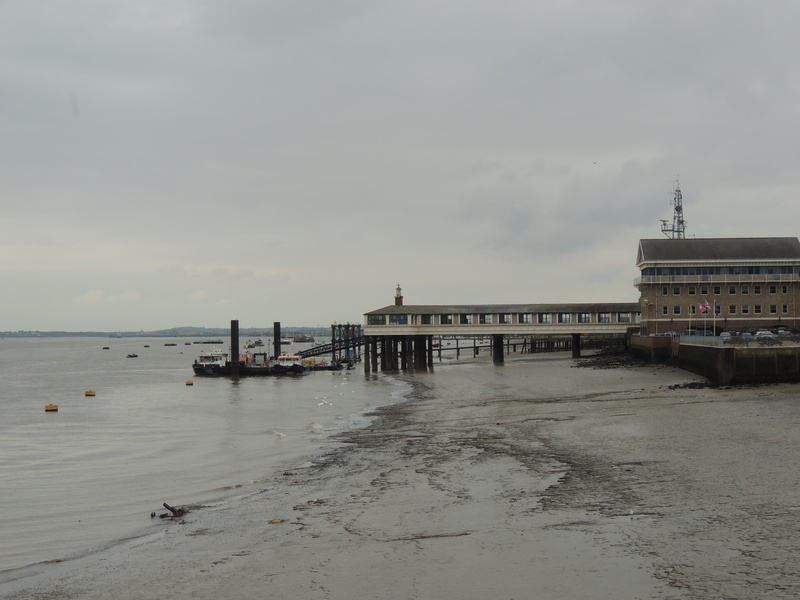 In 1617, the Rolfe’s made ready to return to Virginia, but Pocahontas had to be taken from the ship at Gravesend due to illnes. She did not recover and died. 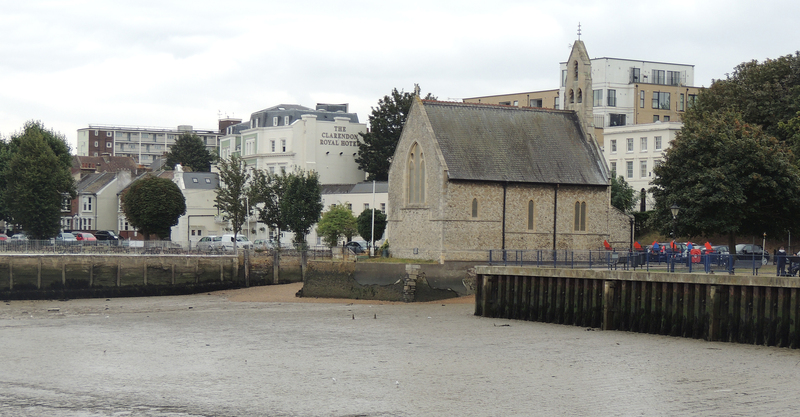 She was buried in the churchyard of St George’s church in Gravesend. Unfortunately that church was destroyed by fire about 100 years later and no record survives of the location of the grave. 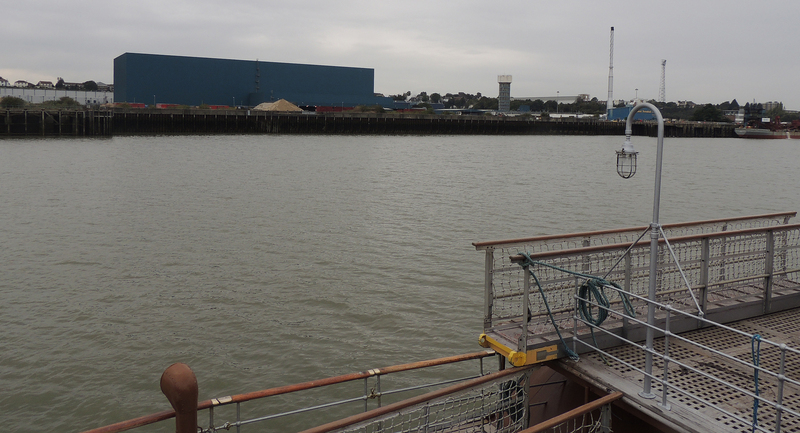 As we leave Gravesend to make our way upstream the scenery changes and the industrial side of the river becomes evident.